We are a small company, dedicated to designing, installing and maintaining reliable off-grid systems in the very most remote and difficult locations around the globe. All of our staff have lived off the grid for at least 10 years. We know a lot about the challenges and rewards of remote, off-grid systems...and we learn more with every new job. If you need a system that ties into the grid but can still provide backup power to your critical loads, we'd also be happy to help you. This is a very common situation for self-sufficient folks who want all the modern conveniences, but still remained prepared for extended grid outages. We also provide NABCEP / IREC registered training classes for individuals, companies and organizations. Inquire for more information. 22 years experience designing, installing and maintaining off-grid solar, wind, hydro, water pumping, data acquisition, communications. Contributing author; Home Power Magazine, Solar Professional Magazine, The Journal of Green Building, Back Home Magazine, Countryside Magazine and more. Co-author, Homebrew Wind Power ISBN 978-0-9819201-0-8. NABCEP / IREC / ISPQ registered Continuing Education Provider. 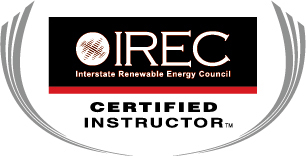 IREC Certified Instructor ™ for PV Installation Professional and Small Wind Installer. Trained solar and wind site assessor. OSHA Advanced Competent Climber/Rescuer certified. OSHA 30 Construction Safety certified. Professor of Solar Energy Technology at the Ecotech Institute, Aurora, Coloado. Tower technician, GIS and mapping, off grid systems technician. Over 20 years off grid. Small wind specialist, including design, construction and towers.